Upcoming dates are in the sidebar to the right. 1. Pre-workshop: Local Data Collection. You will have three weeks at home to assess and clearly define local need. Designing & Funding Sustainable Development Projects. Locally Collected Data: 3 weeks pre-workshop online training component. 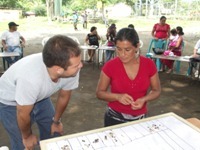 Guided Field Data Collection: Community Needs Assessments. Conduct a needs assessment with a target population in preparation for use in the workshop—guided through distance learning by CSDi staff. We will provide all of the tools and information you need to conduct the needs assessments. 2 field days. Don’t have community access? Join us for 2 field days the Saturday and Sunday prior to the workshop conducting a participatory needs assessment with our local partner at the workshop location. 5 days. A Face-to-Face Workshop. Full Sustainable Project Design and Development. Working with the CSDi workshop leader, you will use your needs assessment to begin the development of a complete, fundable, launchable project. OL 140 Diploma. Receive a Diploma from the Center for Sustainable Development. Are you working in international development in areas such as food security, health and hygiene, watershed management, agriculture, or income generation? Then this training workshop is for you. Previous course participants have developed international projects using over 270 different kinds of activities. Would your organization like to learn how to increase efficiencies and impact in their programs? This four month diploma program—attended by international participants—will provide a system of building block activities for you to use on the ground in developing and implementing successful adaptation to climate change projects that can be co-managed and sustained by communities. Based on use by participants from 153 different countries, the techniques illustrated in this training course use a step-by-step progression to lead participants through problem assessment, sustainable project design and implementation. You will package your sustainable project design components for enhancing donor communications. The course will equip you with the tools and techniques you need to improve current project effectiveness, to introduce sustainable, impact-oriented project design into organizational programming, and to generate new nonprofit projects. This practical training course is appropriate for administrators, policymakers, all levels of practitioners—as well as for students of development. Although many NGOs are working to reach the UN’s Sustainable Development Goals on target, we still have over 1 billion people suffering from hunger, a lack of safe drinking water, and extreme poverty. An important underlying cause of these challenges is that development effectiveness can be limited by in-country field staff’s poor access to mission-critical information and training. CSDi is delivering solutions by providing sound information, tools and training for development staff worldwide. In an effort to reverse this trend, the Center for Sustainable Development (CSDi) provides live training workshops and distance-learning courses for development organizations, grassroot organizations, NGO staff—and individuals interested in the development world. They present an ‘online field experience,’ and lead participants in the process of developing sustainable, self-sufficient communities. This blended learning program will lead you through the development of a real project, in real time, in a real village, and leave you with the practical field tools to sustain it. Where does one turn to for information on designing, launching, and managing a well-designed sustainable project? For many staff members it may feel overwhelming to launch a new project. Where do you begin? What practical tools are working today? How do you convey sound, sustainable concepts to a community? Together, during the training workshop, we will explore the full process of developing sustainable programs. This is a blended learning workshop. During the month prior to the five day workshop, guided by CSDi staff, you will conduct needs assessments with a local community—in the country where you work—in preparation for the workshop. These will become the basis of your project. Arriving at the 5 day workshop, you will spend five days developing and fine-tuning a project that will address the specific context that your community faces. At the end of the live workshop, upon returning home, enroll in OL 343 and OL 344. Then return to work with your community—and launch your project’s implementation— all under the continuing support and guidance of your CSDi workshop leader. • We will provide a library of links to resources for the different challenges that you’re likely to encounter: scientific studies, manuals, field guides, and community capacity building resources. • Course facilitators will work individually with you as consultants throughout the week in developing your specific project. Course participants’ sustainable projects have included 270 different kinds of solution oriented activities impacting over 400,000 people. To learn more about the breadth of participant’s projects, investigate course participant countries (153), organizations (500), and project themes. The goal of the workshop is to guide you in developing a real project for your target community. As this is community-based development, we need to identify your community’s perception of their need. In the 3 weeks before the live workshop the workshop facilitator will guide you in leading a participatory needs assessment with your community. We will provide handbooks and workshop lesson plans for leading the assessment. The course facilitator will then work with you to refine the assessment into a simple project outline that you will bring to the live workshop with you and begin developing it into a full project beginning on day one. 3 Simple Steps to Launch Your Project. Upon enrolling in 343 and 344, we will support you in launching the project with your community that you developed in the training program. In the month after the live workshop, after you return home, the workshop facilitator will provide guidance, consultation, and resources—and will guide you in forming a community based project management committee, engaging the committee in project management, and leading your first capacity building workshop with community members. Staff from large INGOs, staff from small in-country NGOs, people considering career changes, and business owners with a social conscience. The workshop is US $1,250.00 per participant. This covers the 4 week blended training fee (including the 5-day live workshop), resource materials, and guidance during the pre-workshop field components. Participants will be responsible for their own travel expenses and arrangements such as airport transfers, food, accommodation, health/accident insurance, and other personal expenses. Workshop participants who successfully complete the workshop will receive a completion certificate. OL 140 Diploma participants who enroll in OL 343 and OL 344 and successfully complete the courses on time will receive an OL 140 diploma. Your certificate will be e-mailed within 30 days of the end of your course. I want to take this opportunity to express my thanks to you, and your staff for your continued support during the courses in the feedback and comments that enhances our work and for the opportunity to participate. I thank you all very much. Gillian, Grenada. You have just made our day. Thank you for your usual prompt and generous reviews of our work. Your system is most effective. Helps us to do well. Thank you once again. We are grateful for your mentorship. Carolyn. US. We are thankful for your guidance, for coming up with these courses that are relevant, and for your continuous optimism and encouragement. Wye Yee. Malaysia.